ADVENTURE BEFORE DEMENTIA: WHY WIVENHOE? 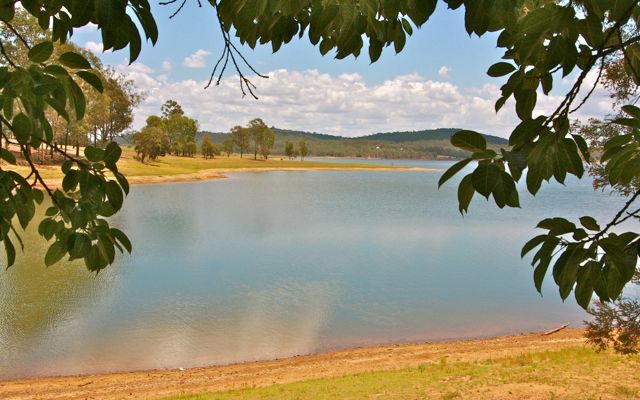 We went to Wivenhoe Dam about 80k away from Brisbane to meet friends for lunch at the little restaurant there. 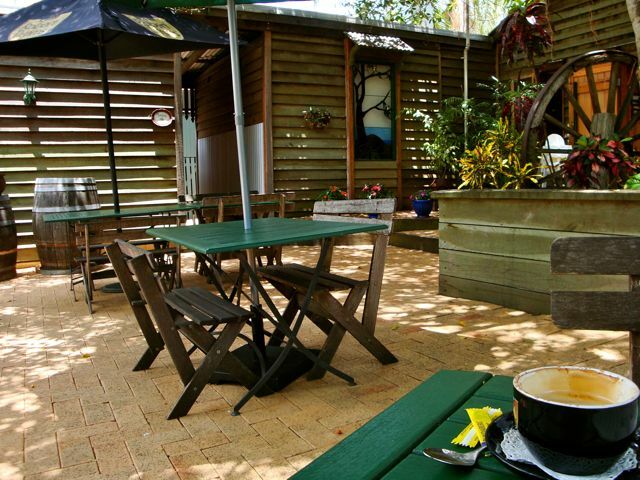 (That's why) On the way we stopped for a coffee at the little town of Fernvale. We parked near this beautiful tree. I think it is a Poinciana Tree but it could be a Flame Tree although it doesn't look the right shape for that. Taking a page out of Red Oz's blog we trotted into the local Bakery. .....wandered through to the back garden seating and settled for a coffee. We arrived at the lake ahead of time so we grabbed our cameras and walked around the parklands. We have had a wet year so there is plenty of water in the dam. Last year it got so full that engineers had to discharge water to avoid the wall being damaged. Unfortunately more torrential rain arrived and consequently Brisbane was flooded. Just recently there was a court case over the management of the dam and the engineers were found guilty of not following the rules. I loved the colour of the grass. Many photographs later our friends arrived and we had a relaxing lunch in a cute little restaurant overlooking the lake. Labels: Wivenhoe dam and lake QLD. i like the courtyard tables, what a beautiful spot to eat. golden grass is gorgeous and it does look like our poinciana trees here. How amazing that the resturant was open! We got an icecream there many years back but it has been closed every time since then. 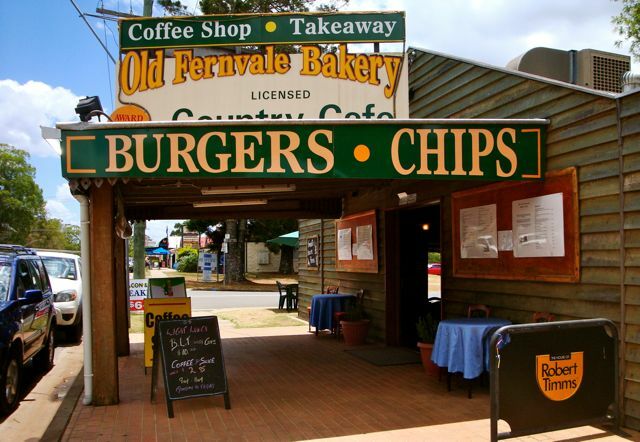 That coffee shop at Fernvale is our morning tea stop too - its bakery is very popular. You had a very photogenic place at which to meet your friends. I admire you for bypassing those delicious pastries at the bakery. Great photos. MMMM...burgers and chips sounds good to me. Love the lake. What lovely scenery for a day trip! I don't think I could have bypassed the sweets. THAT might have been my lunch. Such temptation in that case! The photo of the lake is a breathtaking view and a lovely shot of the grass. You did a great job blurring the background!!! That was done in camera by using a big aperture and a long lens to get a shallow depth of field in focus and the rest is blurred. A funny name, I first thought the wife of "Ivanhoe? A nice place to visit and brave of you to pass the pastry without eating it. Last week I saw some floodings in Brisbane on television, so I can imagine you have lots of rain. Love the yellow dry grass. A beautiful day out .... 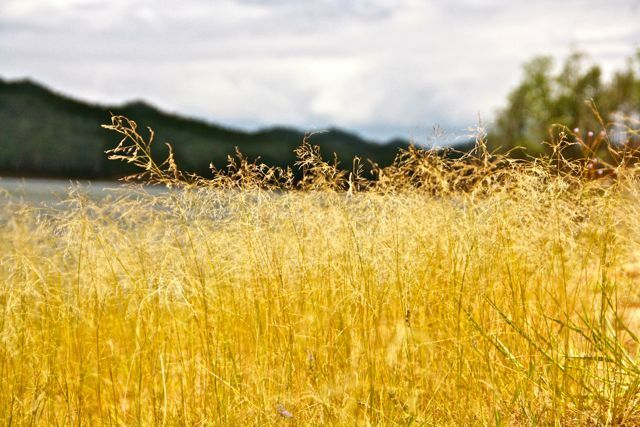 I love the warm golden colour of that tall grass and what a gorgeous place on the dam to meet up with friends for lunch. 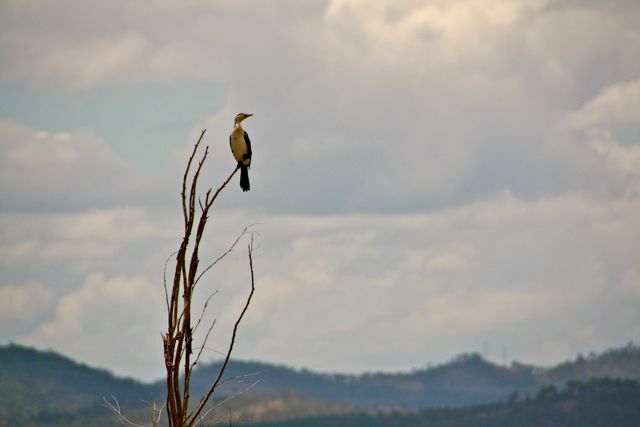 Great shots of the Wivenhoe Dam area. The countryside looks great, but with all the rain of summer, that would be expected. I am greatly pleased to note that no Paterson's Curse is to be seen! ha ha. Actually you have done very well, no purple of anything! 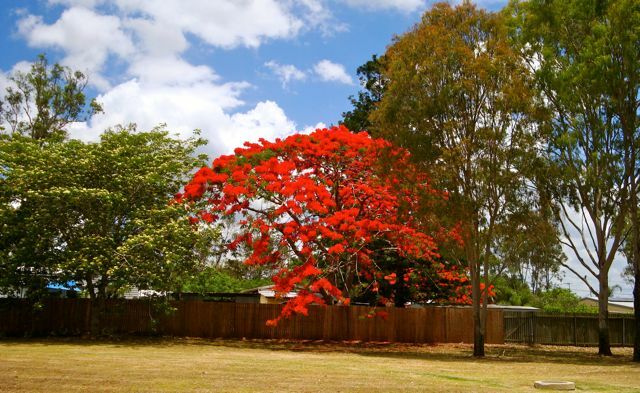 Do Poinciana Trees, shed their blooms like Flame Trees? There seems a lot of dropped blooms on the ground!!! Oh for some of those rich looking cakes with ice-cream or cream. I wouldn't have been able to resist. Great photos as always and explanations, well done - "sis"! 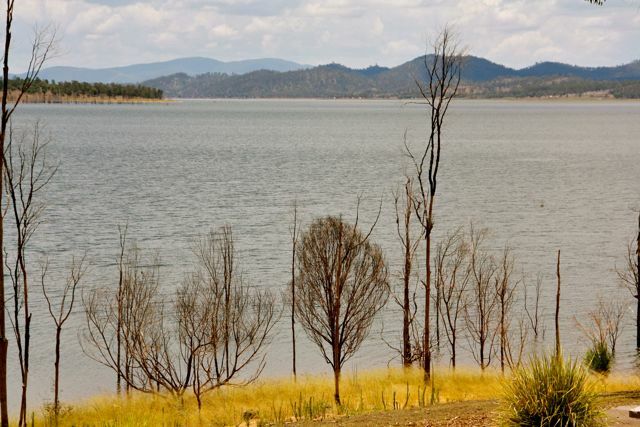 Perhaps it needs to be known as the 'infamous Wivenhoe Dam' for a while. Really good photos by the way. Sometimes waiting is fun when you have a camera and a scenic place. I am bowled over by the amazing bright red tree. We have nothing quite so vibrant - red shrubs but not trees. Beautiful shots, Diane. I have loved my Canon like yours so much, I decided to treat my two sons' families with the same camera. They have been admiring mine since I got it. Yesterday, I ordered each son the camera, three lenses, camera bag, book on the T3, memory card, tripod, and many of the accessories. They have no idea I did this, so I know they will be so excited when they receive the cameras. St. Jude gave me such a nice retirement bonus check, and I wanted to share it with my two sweeties and their families. Lovely photos, Diane. This looks like a nice quiet place to take a stroll and enjoy the view. 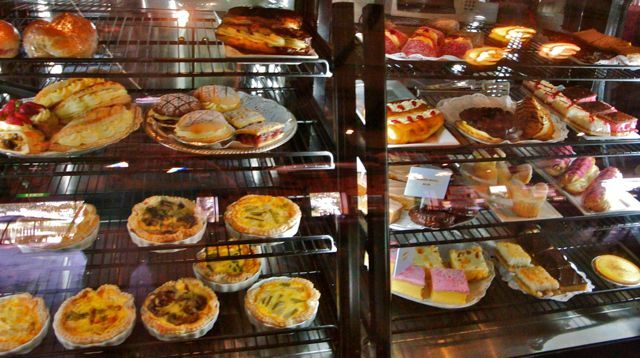 I would have had to eat a treat from that bakery, Diane--everything looked so good! Good to see Wivenhoe in a peaceful state, even though Queensland is anything but peaceful recently what with the change of government and all. Any how, thankyou for the photographs and filling us on on that particular aftermath of the floods. Thank you. I'll keep that in mind, take different things. What a lovely place and this "Old Fernway Bakery" looks so English, lol ! That little restaurant must have a beautiful view on the lake. Wow, you were not tempted with all the yummy baked goods? Looks like a cute place for a cup a coffee. The lake and grasses look beautiful and you know me I love the bird. Wonderful collection of photos. I hope you have a great day! Good to see a positive side of the dam... it's quite a pretty spot, isn't it! Those photographs make me want to jump on a plane and fly south. Even though I would be leaving behind Spring and flying into Autumn I wouldn't care, it looks absolutely beautiful. That first picture in particular, looks like it has been carefully painted with a rich red paint : perfection. I love the color of that grass too...and that red tree. I don't know how you managed to resist those fattening goodies! It looks you have had a wonderful day. I love the yellow color of the grass too. The colours in your photos are lovely. it must have been a most enjoyable day! looks like a wonderful day. glad you have had a great time. i really enjoyed your photos and i love the colour of that grass, too. and thank you so much for your kind words and get well wishes for my sister. I remember before the dam was built and then after watching the water slowly rise. There used to be a low level bridge on that road that flooded frequently. I like that area quite a lot. Where did you take the title picture from? High on the Southbank wheel perhaps? It's great! No. I took it from Mt Coot tha with a telephoto lens. I know Wy you went there ;>). It looks a lovely place for lunch~ That's my favorite, when you can take a walk and get some pics and then have a nice meal and catch-up time with friends. A perfect outing.